elemental sounds of raw electricity convolved with air activated water(bubbles) dominant frequencies are captured and directed ,via chance operations, through random atomisations and intermixed with native fly field recording that were slowed down by 400%. organic chemistry is kindly supported by The University of Sydney-The School of Chemistry. 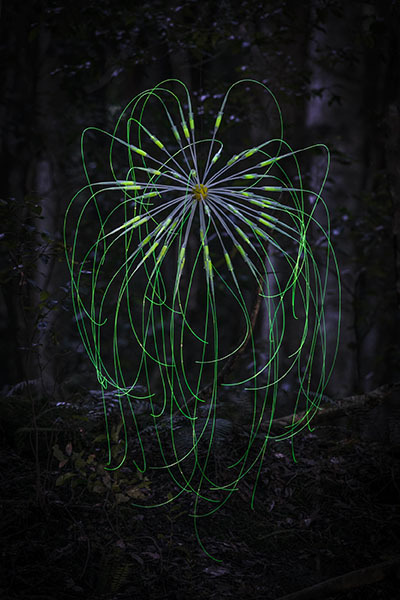 organic chemistry uses sound and luminescent sculpture to create an enchanting and immersive habitat within the Blue Mountains rainforest. 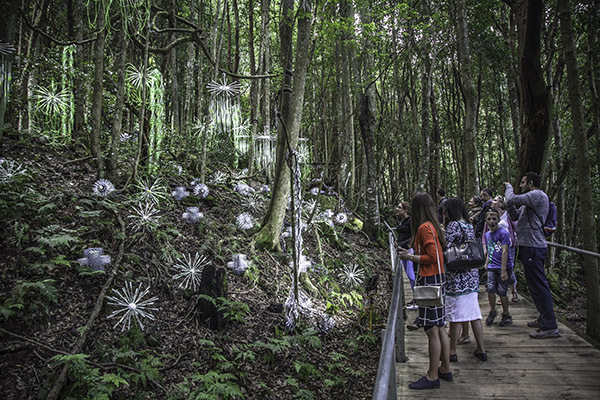 The project aims to create a sense of wonder and generate awareness for the native environment by highlighting the bioluminescence that occurs amongst the fireflies, glow-worms and fungi that live there. 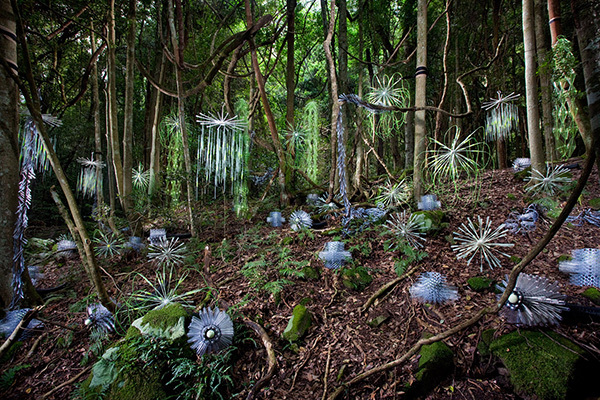 The work consists of a large outdoor installation, set up along the Blue Mountains Scenic World boardwalk. The aerial and grounded components of the installation include an assemblage of multiple transparent test tubes, transfer pipettes and other materials reminiscent of chemistry compounds. 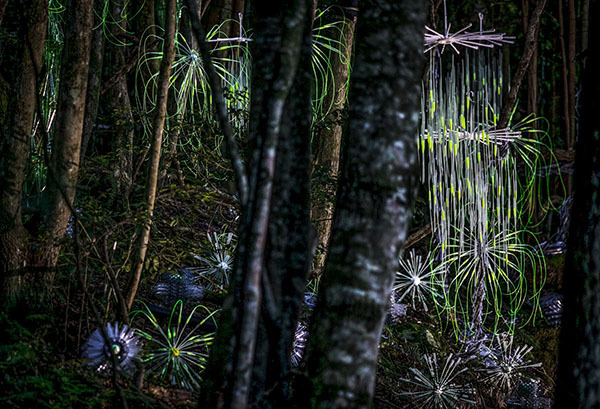 organic chemistry creates an animated ecosystem that slowly glows, oscillates and emits sound. The sculpture is sensitive to natural elements and moves with the breeze, rain and wind. It glows under the effect of luminescent particles, which become chemically charged when exposed to both natural and artificial light sources that have been set up within the installation. The afterglow becomes visible only when the background light returns to a semi-dark condition. A looping, experimental sonic track plays within the installation, furthering the immersive experience of the work. 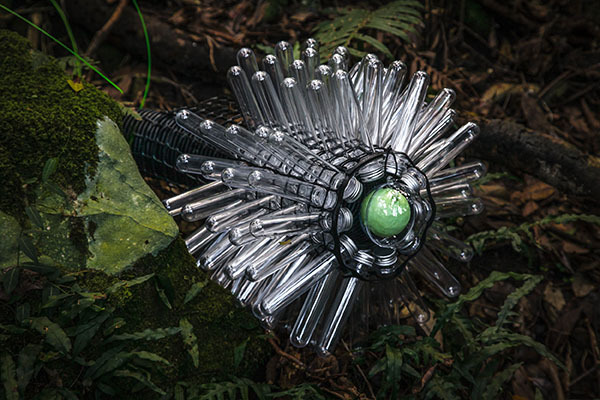 It includes a collage of field recording and experimental sounds that amplify the silent processes of organic chemistry taking place in the forest area.